Edited by Martha Friendly, Irene Kyle and Lori Schmidt. These proceedings from a one-day symposium on policy-relevant child care research was held at the Learned Societies meetings in 1991. 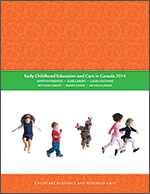 Overviews of developmental psychology, sociology, and economics approaches to child care research as well as current Canadian research on school-age child care, family day care and a model for determining child care demand are presented.